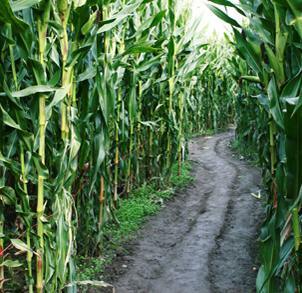 15 Acres of Corn Mazes! Our corn mazes are designed & cut by the J. Webb family themselves, without the help of modern technology; with the help of aerial picture verification, we know we've got the art mastered. While we require children to be accompanied by an adult, we do not require farm admission for our guests. What does this mean? If grandma & grandpa want to look at the farm animals or sit by the campfire while the rest of the family takes their challenge into the mazes, they can … free of charge! It is a different world at night; try our mazes under the light of the moon. For comfort against natures nightly noises, you may bring your own flashlight or rent ours for $1.